The Darsan Promotional Products Company announces the launch of their website http://www.Darsanpromotionalproducts.com, with a desire to lead the area in promotional marketing efforts. The Darsan Promotional Products Company of the Tri-City area of Michigan recently launched their website, http://www.Darsanpromotionproducts.com, with the desire to provide superior promotional products for existing clients, at a reasonable cost and with superior customer service. As a value driven promotional company offering a vast array of promotional marketing tools available to all, they hope their affordable pricing, extensive product lists and shipping convenience will stand to set them apart from their competition. With exceptional customer service as Darsan Promotional Products' foundation, they are able to offer a multitude of products to clients looking to purchase promotional materials of all sorts for their association and/or cause. It is the wish of the Darsan Promotional Products Company that their dedication to superior levels of customer service will enhance the effectiveness of their product and pair perfectly with the recent launch of their website. Darsanpromotionalproducts.com presents a multi-faceted product list to their clients of: apparel, drink ware, key chains, writing instruments, post it notes, etc. As well as the ability to create a customized logo for implementation into the products to which their clients purchase. From the inception of the company, efforts have remained constant to cater towards those searching for great products at a great price without having to make bulk orders. With this in mind, the company hopes their newly launched website, Darsanpromotionalproducts.com, will now be the primary tool of their clients, offering them the ability to review, design, and purchase their products at anytime of day, any day of the week without the hassles involved in physically visiting a company's store site. Darsan Promotional Products caters to everyone looking for superior products at reasonable rates-paying special focus on literary agencies who seek to promote their products and events. 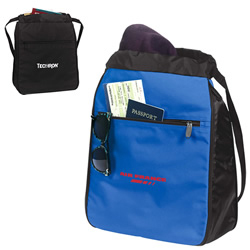 Darsan Promotional Products hopes their website Darsanpromotionalproducts.com will continue to provide quality promotional products, while generating a substantial branding mark and educating others on the inherent benefits of promotional marketing. According to a recent study, "76.1% of respondents could recall the advertiser's name on a promotional product that they had received in the past 12 months. In addition, 75.4% of respondents said they kept their promotional product because it was useful." In addition to the benefits associated with Darsanpromotionalproducts.com's presence as an online resource for existing clientele, the company hopes to establish themselves with new clients seeking to drive traffic to their particular business or website, improve response of their direct mail campaigns, increase referrals, improve repeat business, as well as to improve employee morale. Please contact Daryl Kocks at 800-878-0832 for additional information or visit http://www.darsanpromotionalproducts.com.